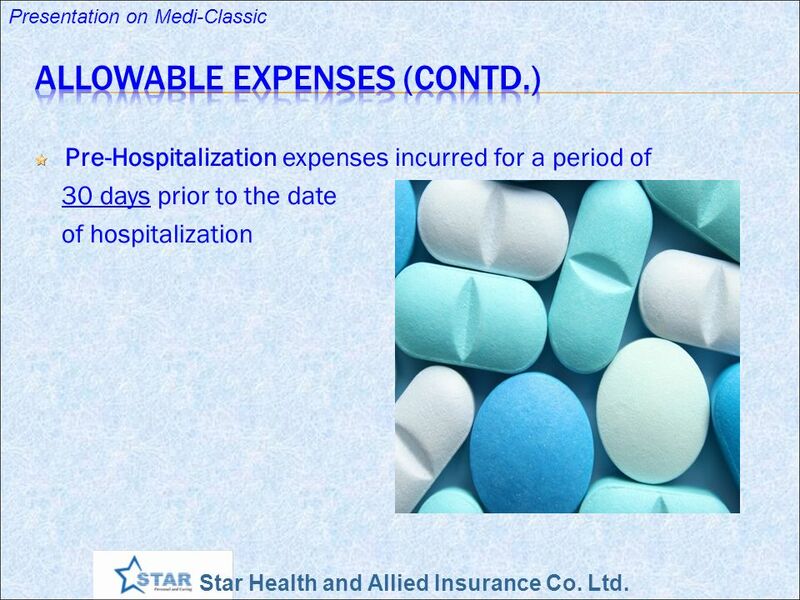 Coverages Hospitalization Expenses incurred as an inpatient for Sickness/Illness/Diseases Accidental injuries In-Patient means an Insured Person who is admitted to hospital and stays there for a minimum period of 24 hours for the sole purpose of receiving treatment. 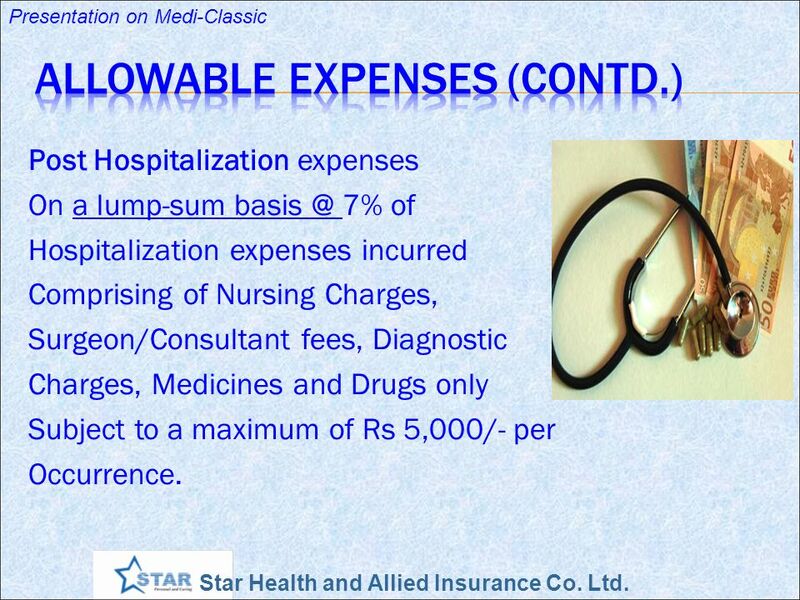 Post Hospitalization expenses On a lump-sum 7% of Hospitalization expenses incurred Comprising of Nursing Charges, Surgeon/Consultant fees, Diagnostic Charges, Medicines and Drugs only Subject to a maximum of Rs 5,000/- per Occurrence. 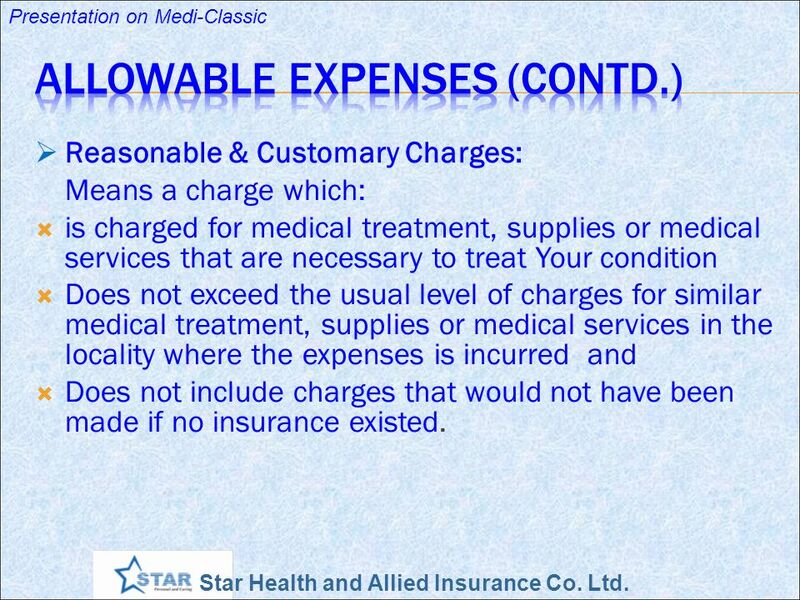 Reasonable & Customary Charges: Means a charge which: is charged for medical treatment, supplies or medical services that are necessary to treat Your condition Does not exceed the usual level of charges for similar medical treatment, supplies or medical services in the locality where the expenses is incurred and Does not include charges that would not have been made if no insurance existed. 16 Day Care Treatment Minimum of 24 hours Hospitalization is not necessary for the following Dialysis, Chemotherapy, Radiotherapy, Cataract surgery, Dental Surgery, Lithotripsy (Kidney stone removal), Tonsillectomy, Cutting and Draining of Abscess, Liver Aspiration, Pleural Effusion Aspiration, Colonoscopy, Sclerotheraphy, The above treatment shall be taken in the Hospital / Nursing Home and the Insured is discharged on the same day. 19 Portability w.e.f. 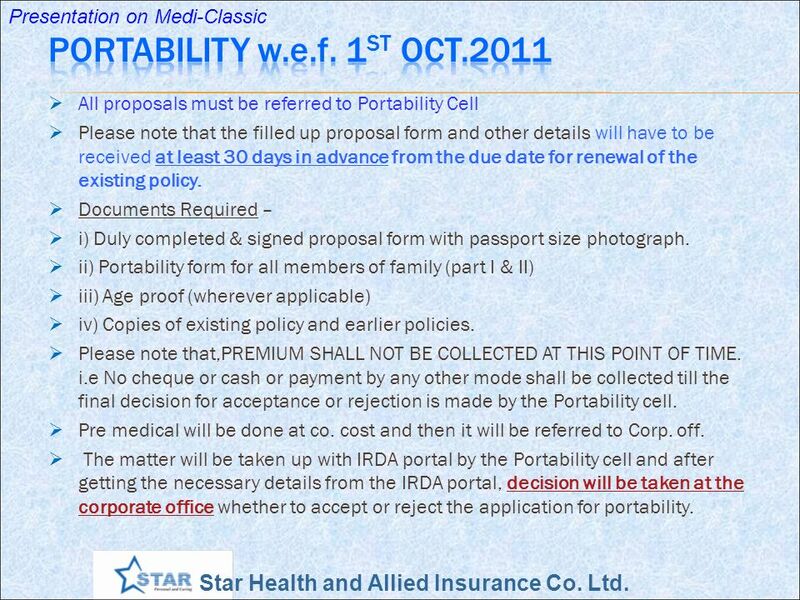 1st Oct.2011 All proposals must be referred to Portability Cell Please note that the filled up proposal form and other details will have to be received at least 30 days in advance from the due date for renewal of the existing policy. 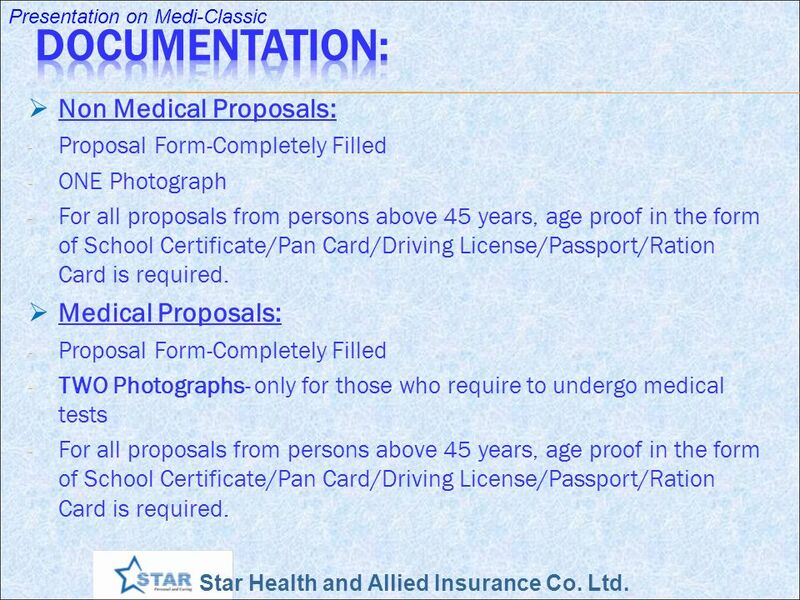 Documents Required – i) Duly completed & signed proposal form with passport size photograph. ii) Portability form for all members of family (part I & II) iii) Age proof (wherever applicable) iv) Copies of existing policy and earlier policies. Please note that,PREMIUM SHALL NOT BE COLLECTED AT THIS POINT OF TIME. i.e No cheque or cash or payment by any other mode shall be collected till the final decision for acceptance or rejection is made by the Portability cell. 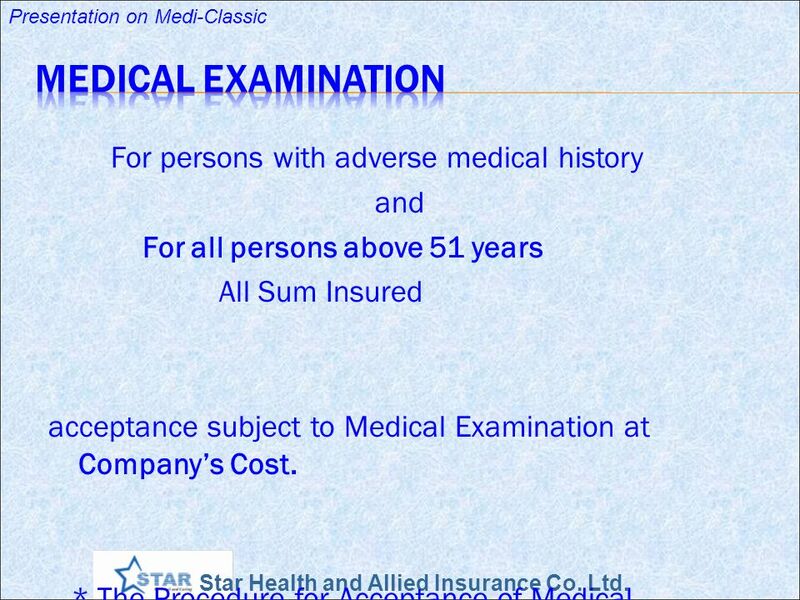 Pre medical will be done at co. cost and then it will be referred to Corp. off. The matter will be taken up with IRDA portal by the Portability cell and after getting the necessary details from the IRDA portal, decision will be taken at the corporate office whether to accept or reject the application for portability. 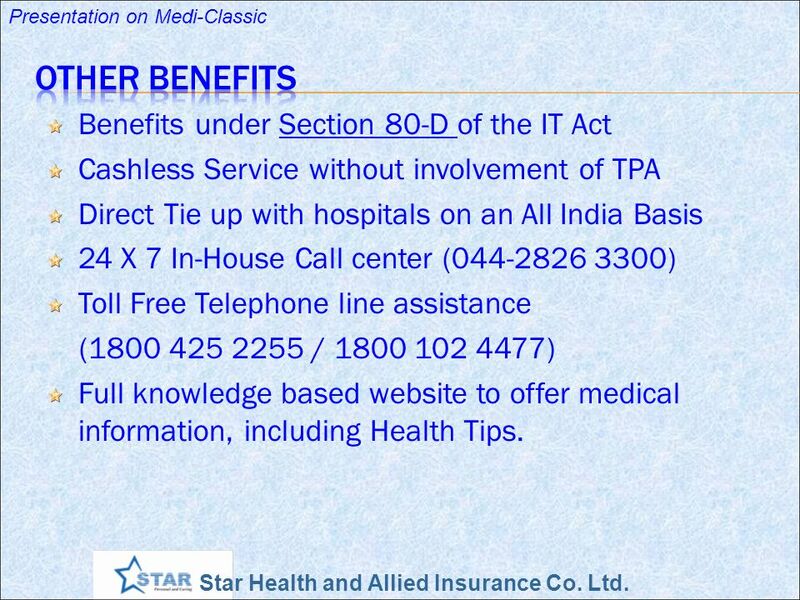 Cashless Service without involvement of TPA Direct Tie up with hospitals on an All India Basis 24 X 7 In-House Call center ( ) Toll Free Telephone line assistance ( / ) Full knowledge based website to offer medical information, including Health Tips. 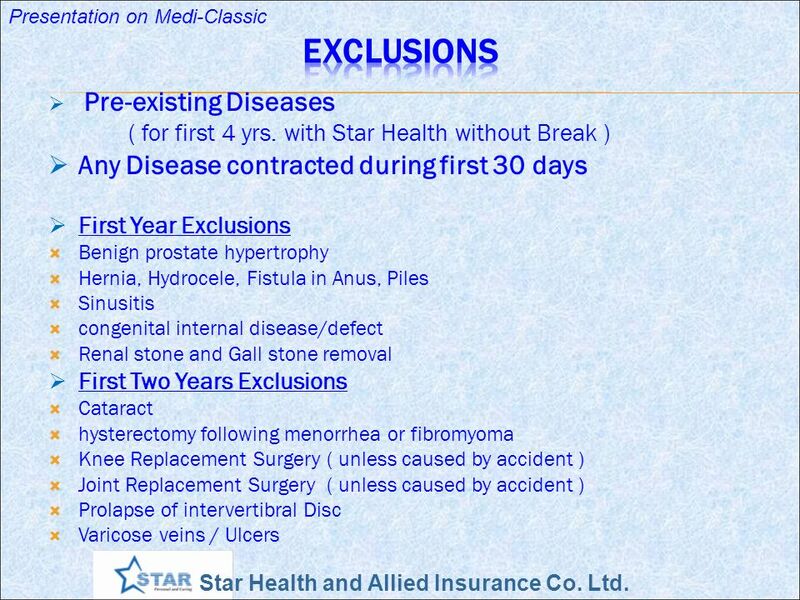 24 Exclusions (Contd.) 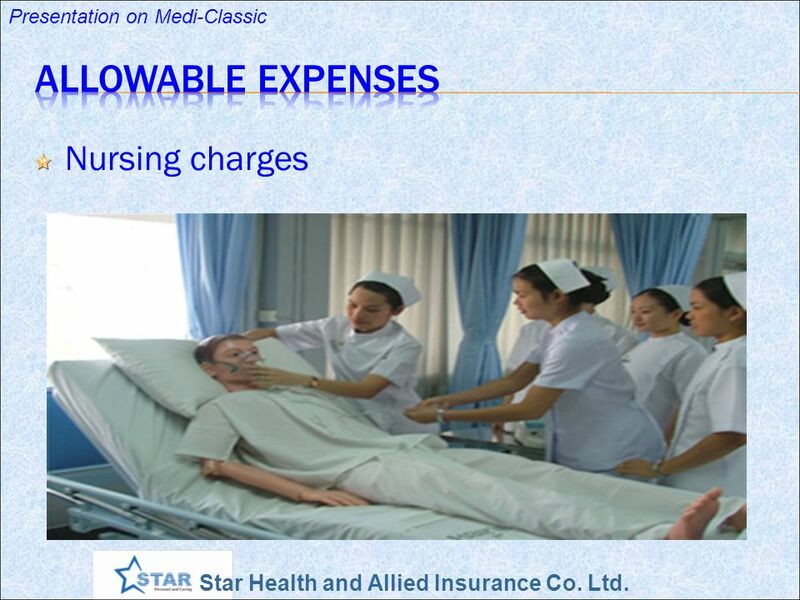 Hospital registration charges, record charges, telephone charges and such other similar charges. 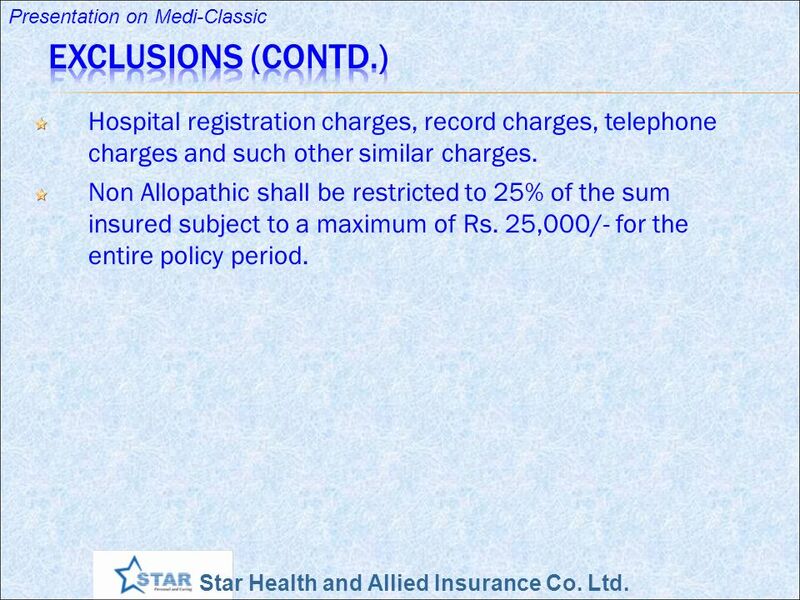 Non Allopathic shall be restricted to 25% of the sum insured subject to a maximum of Rs. 25,000/- for the entire policy period. 28 FAQ: Medi-Classic 1. Which policy is suitable for an individual? 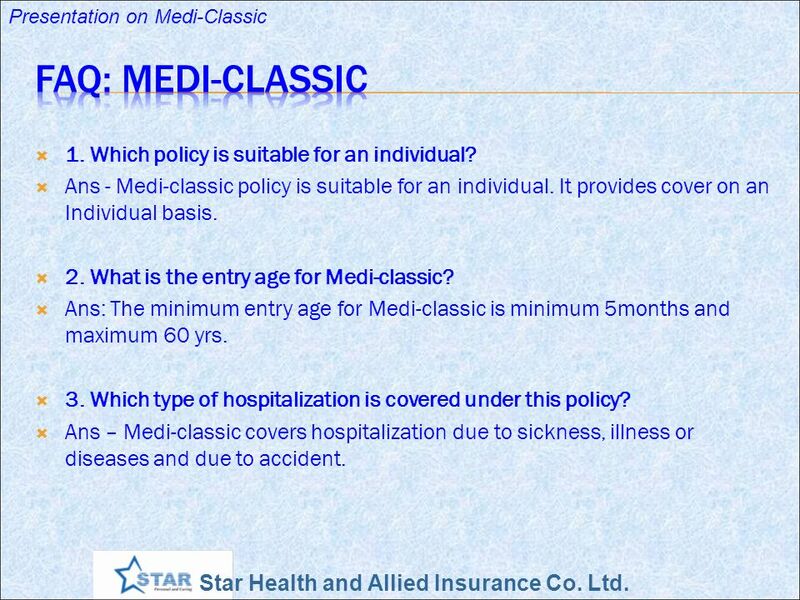 Ans - Medi-classic policy is suitable for an individual. It provides cover on an Individual basis. 2. 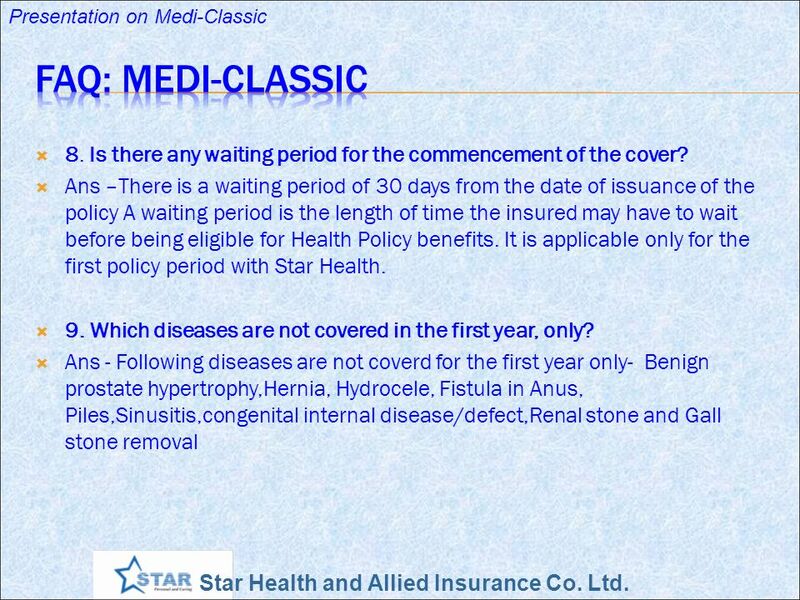 What is the entry age for Medi-classic? 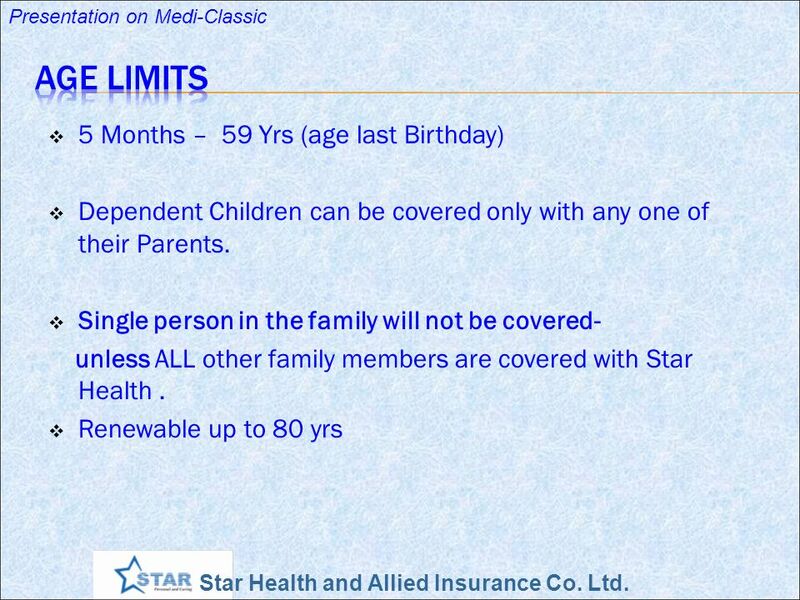 Ans: The minimum entry age for Medi-classic is minimum 5months and maximum 60 yrs. 3. 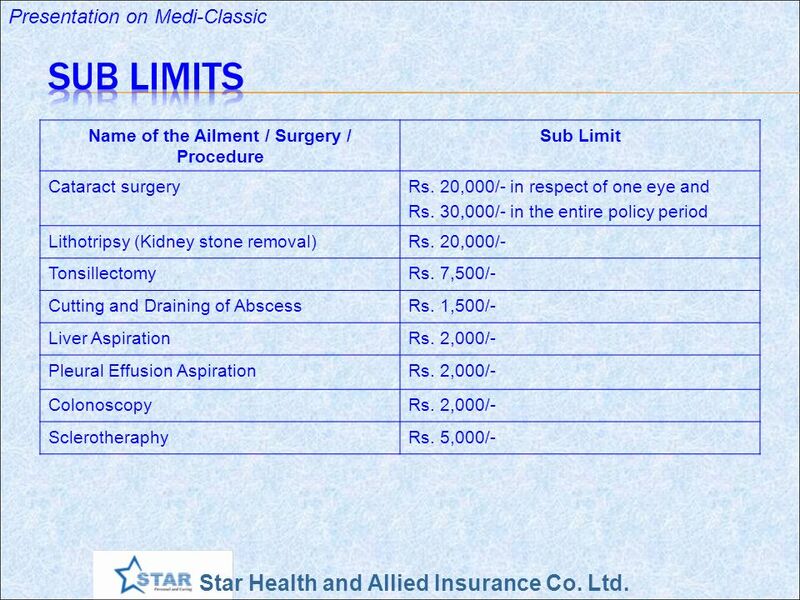 Which type of hospitalization is covered under this policy? 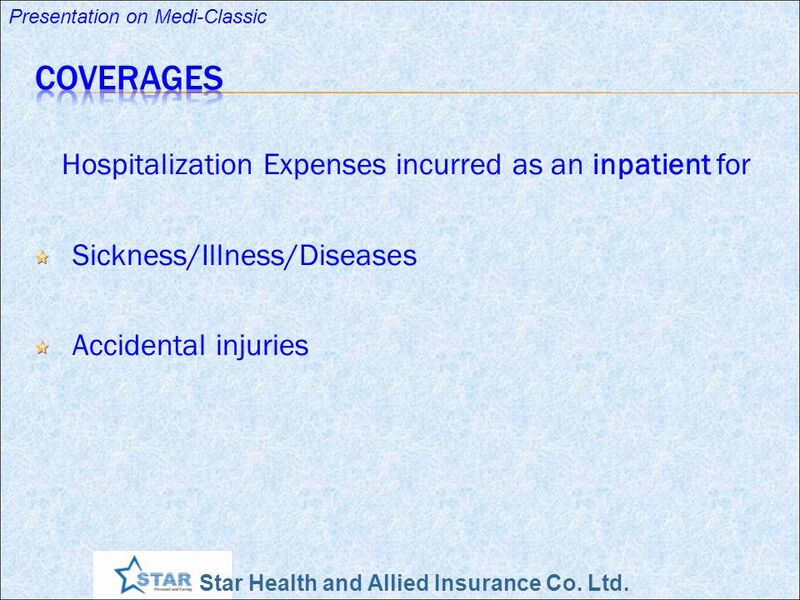 Ans – Medi-classic covers hospitalization due to sickness, illness or diseases and due to accident. 29 FAQ: Medi-Classic 4. 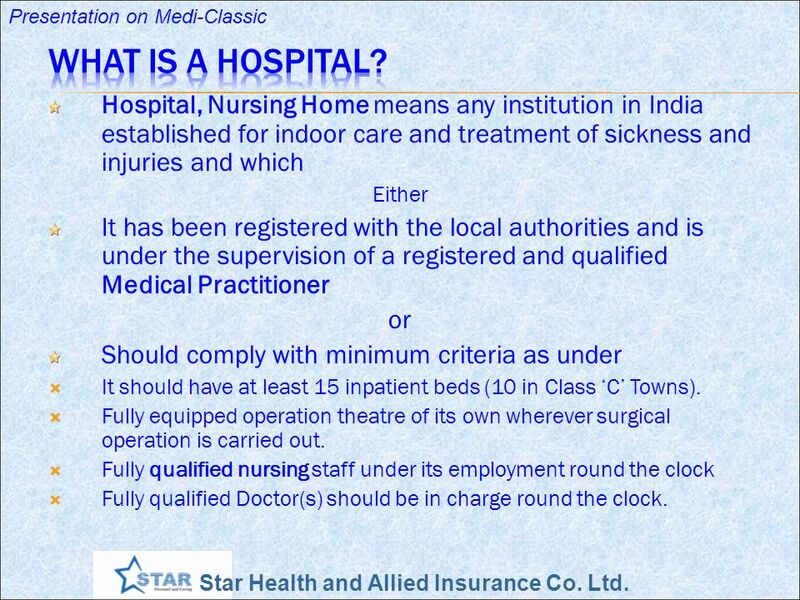 What is the minimum required period of hospitalization? 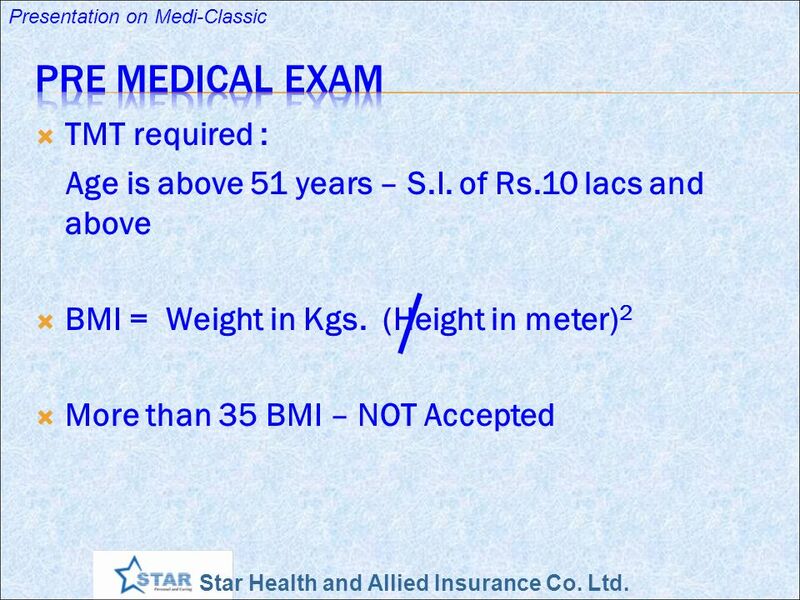 Ans - The minimum required period of hospitalization is at least 24 hours. This rule has some exceptions which are called day care treatments. 5. What is meant by day care treatments? 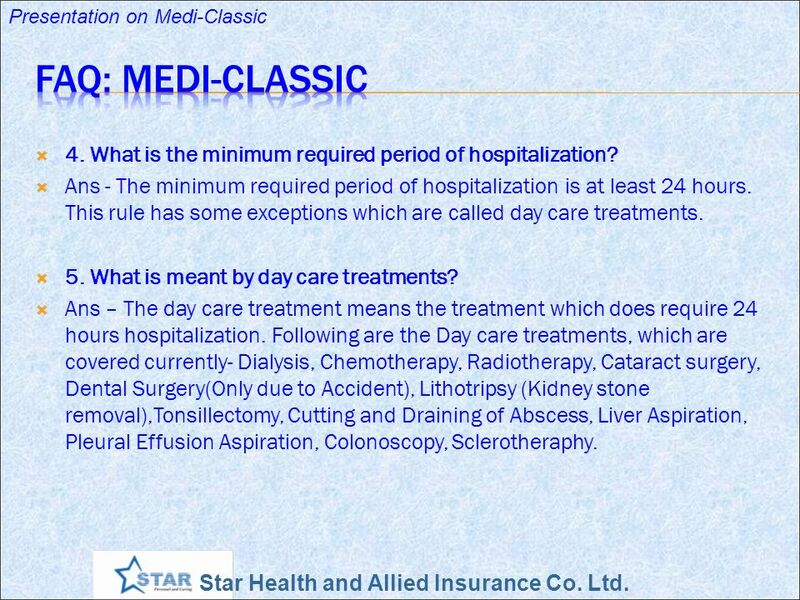 Ans – The day care treatment means the treatment which does require 24 hours hospitalization. Following are the Day care treatments, which are covered currently- Dialysis, Chemotherapy, Radiotherapy, Cataract surgery, Dental Surgery(Only due to Accident), Lithotripsy (Kidney stone removal),Tonsillectomy, Cutting and Draining of Abscess, Liver Aspiration, Pleural Effusion Aspiration, Colonoscopy, Sclerotheraphy. 33 FAQ: Medi-Classic 13. 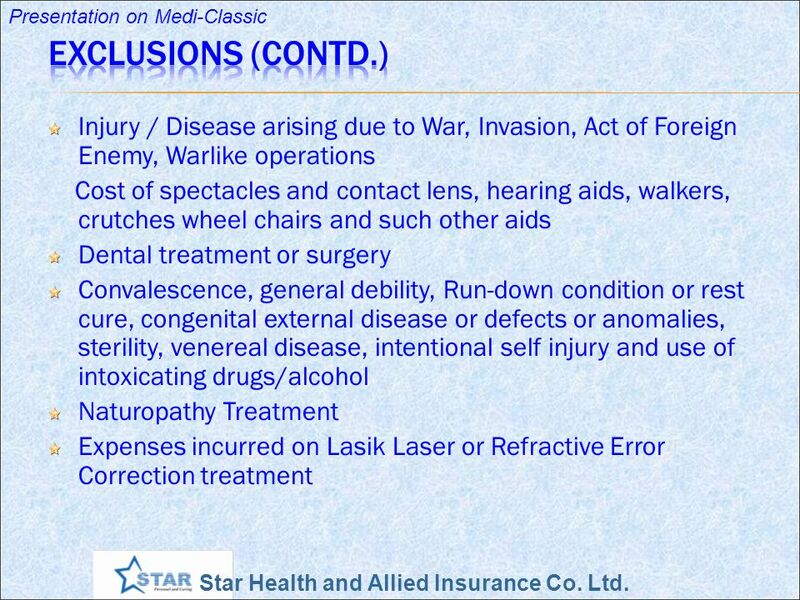 Is any kind of Dental Treament covered under Medi-classic? 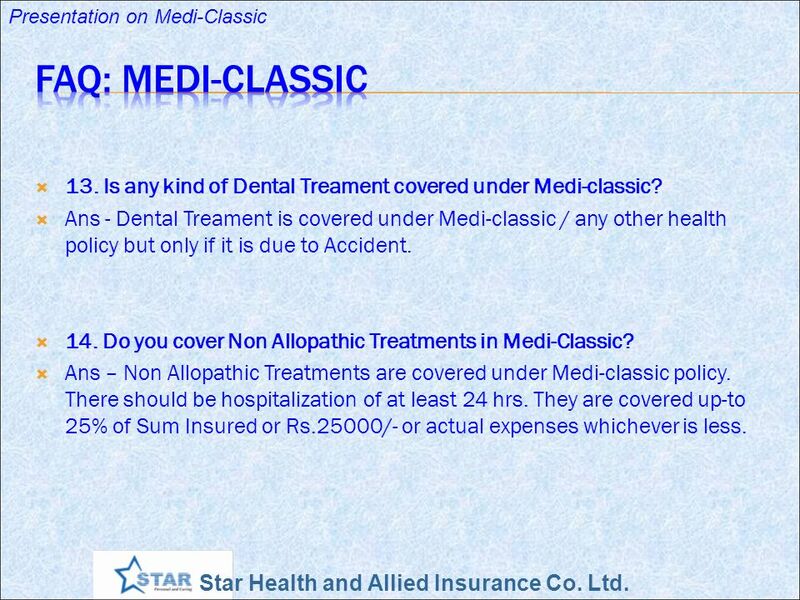 Ans - Dental Treament is covered under Medi-classic / any other health policy but only if it is due to Accident. 14. 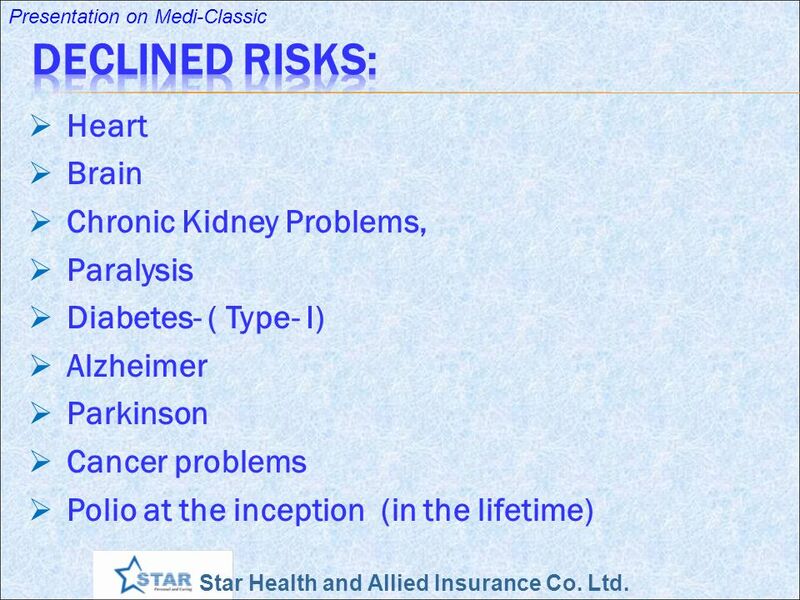 Do you cover Non Allopathic Treatments in Medi-Classic? 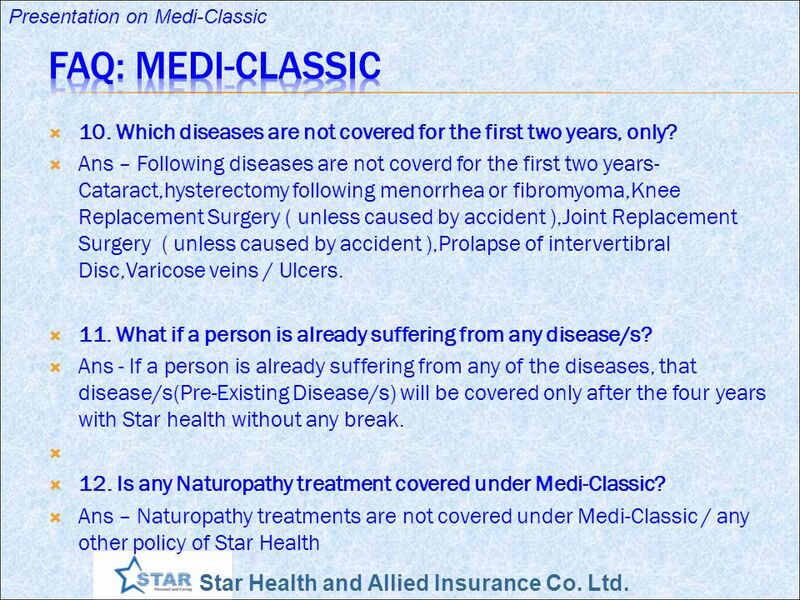 Ans – Non Allopathic Treatments are covered under Medi-classic policy. There should be hospitalization of at least 24 hrs. 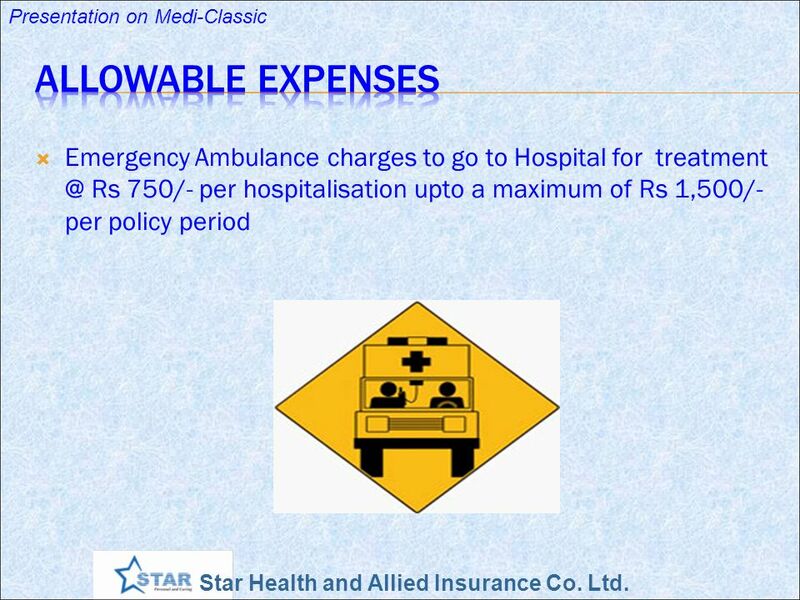 They are covered up-to 25% of Sum Insured or Rs.25000/- or actual expenses whichever is less. 34 FAQ: Medi-Classic 15. 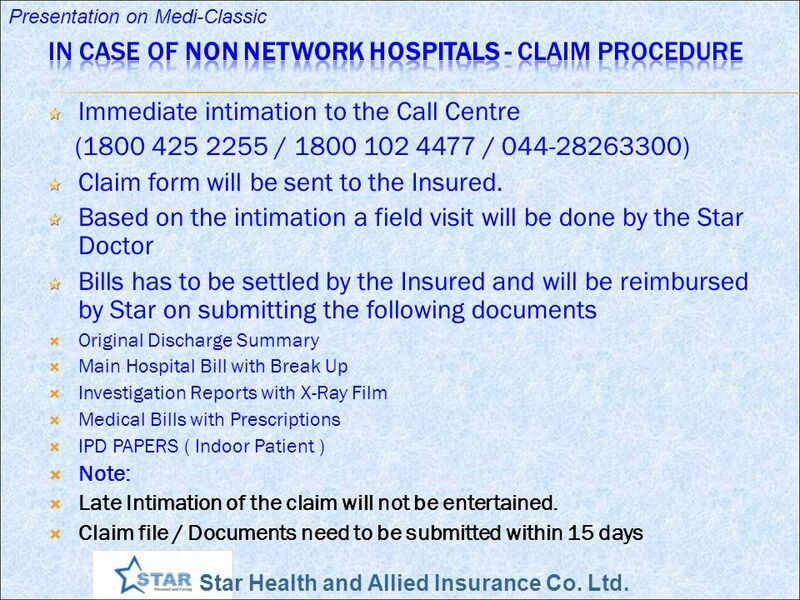 What is the claim procedure? 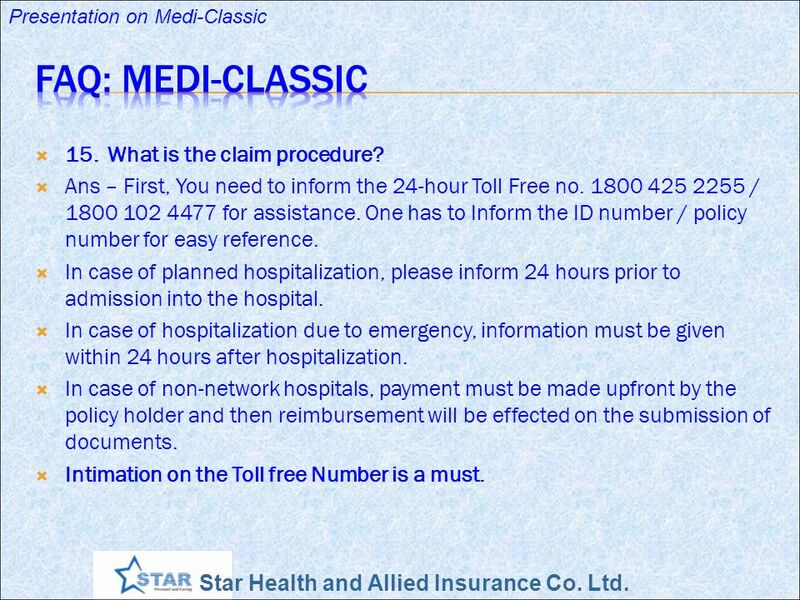 Ans – First, You need to inform the 24-hour Toll Free no / for assistance. One has to Inform the ID number / policy number for easy reference. 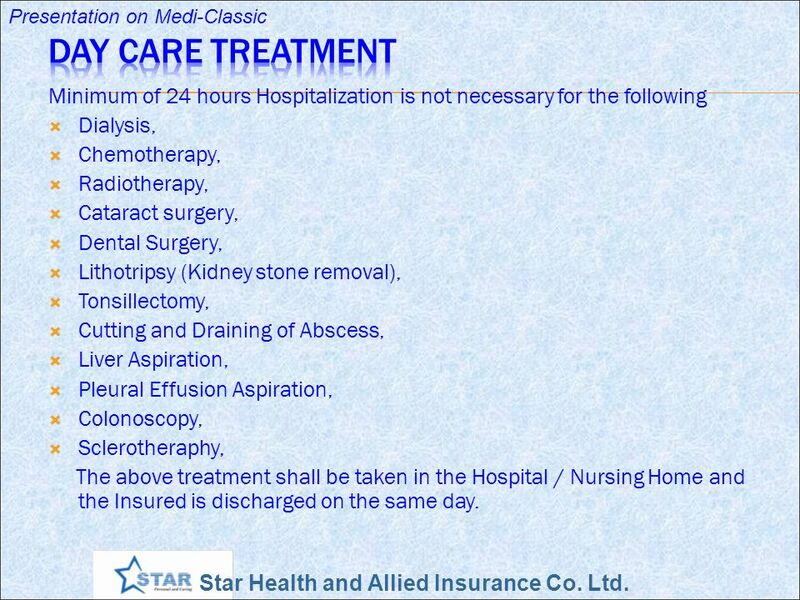 In case of planned hospitalization, please inform 24 hours prior to admission into the hospital. In case of hospitalization due to emergency, information must be given within 24 hours after hospitalization. 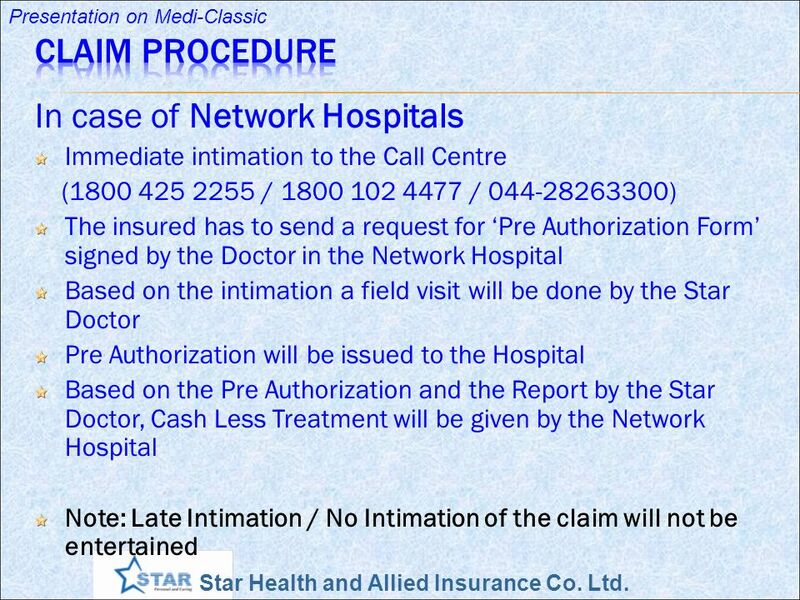 In case of non-network hospitals, payment must be made upfront by the policy holder and then reimbursement will be effected on the submission of documents. Intimation on the Toll free Number is a must. 35 FAQ: Medi-Classic 16. Why should I take a Health Plan if I already have health insurance from my employer? 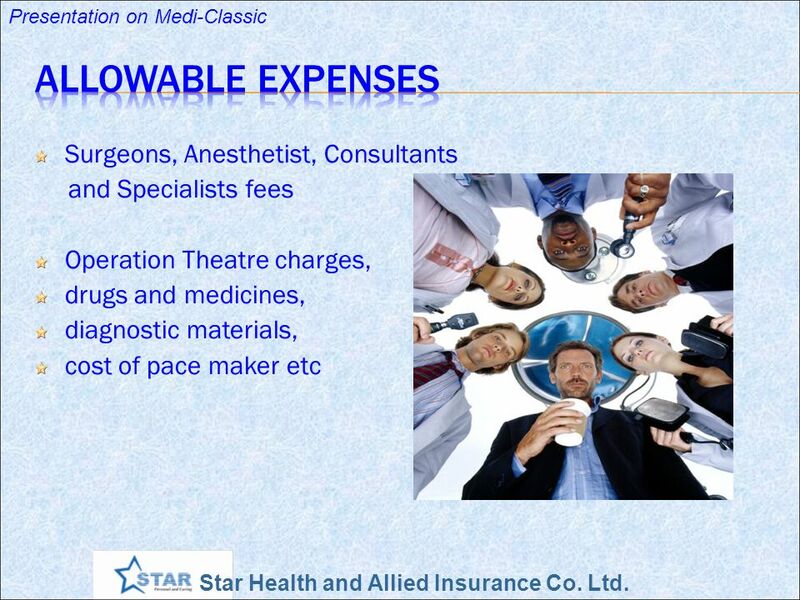 Ans - Your employer will cover your medical expenses only as long as you are in his services. Tomorrow, you may change your job, retire, or even start something on your own. In all such cases you and your family will be stranded if a medical emergency arises and you have not arranged for an alternative health insurance policy. It is at this point of time that Health Insurance policy will come to your rescue. Health Insurance policy can also act as a supplement to your existing medical cover in case the cost of medical treatment is higher than your existing cover level. 36 True or False Mini and Max S.I. 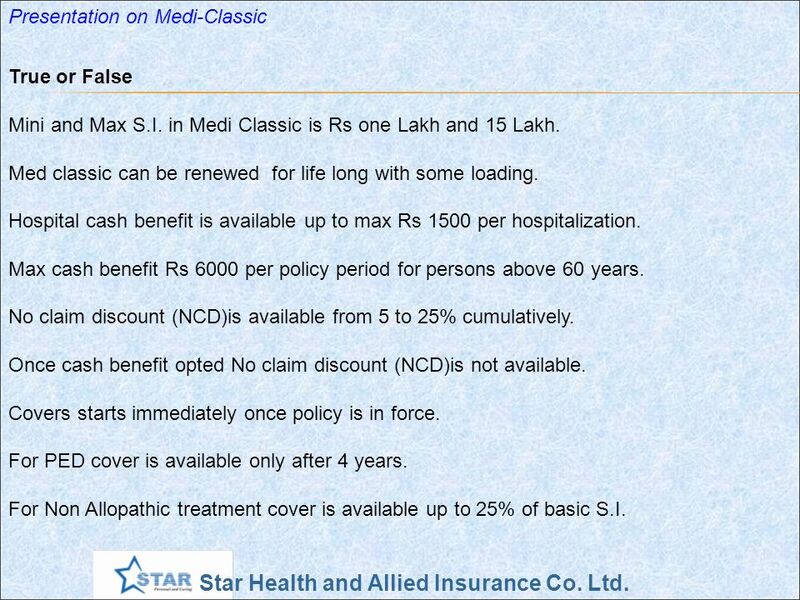 in Medi Classic is Rs one Lakh and 15 Lakh. Med classic can be renewed for life long with some loading. 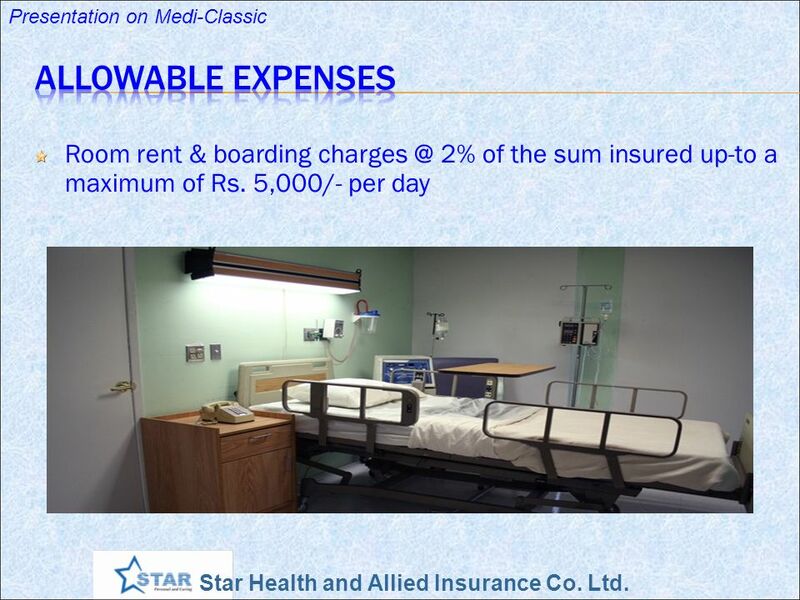 Hospital cash benefit is available up to max Rs 1500 per hospitalization. 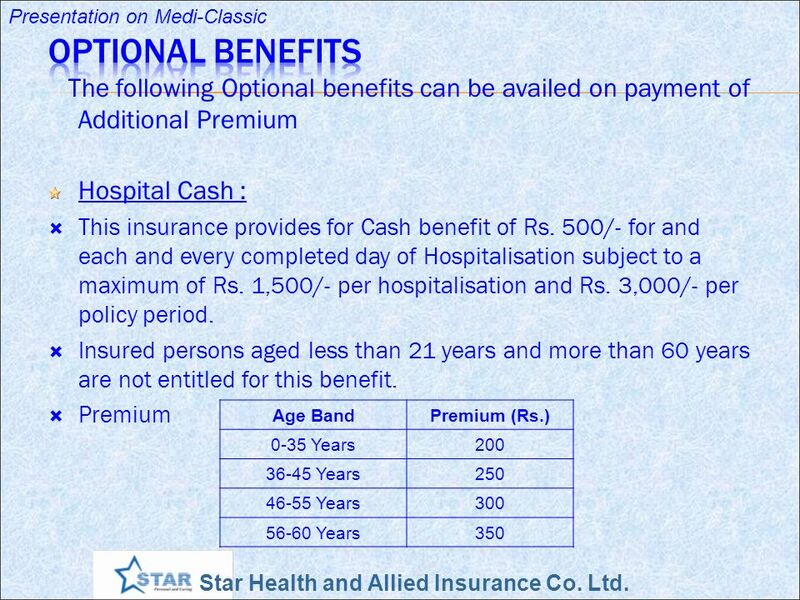 Max cash benefit Rs 6000 per policy period for persons above 60 years. 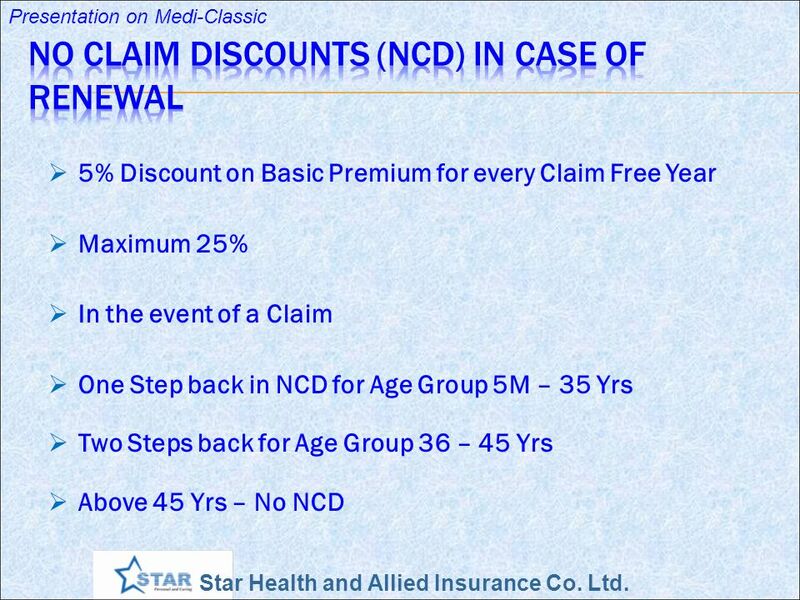 No claim discount (NCD)is available from 5 to 25% cumulatively. 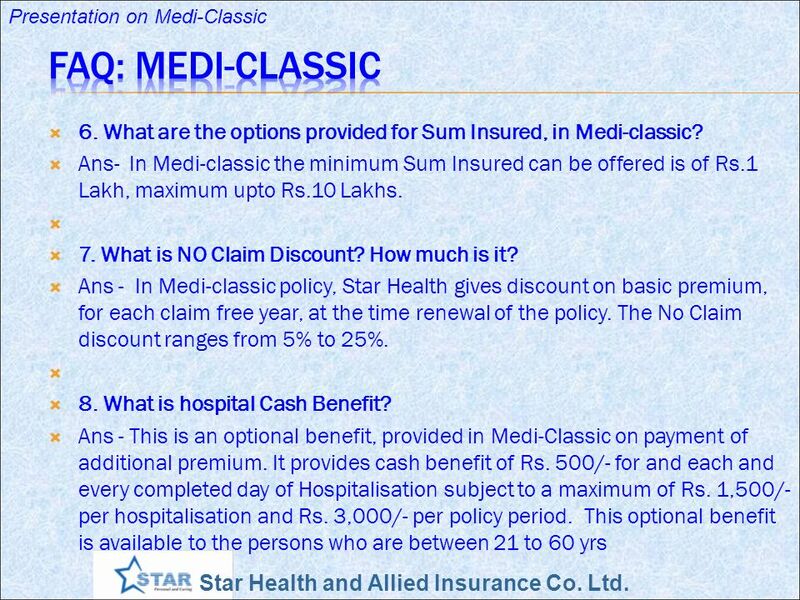 Once cash benefit opted No claim discount (NCD)is not available. Covers starts immediately once policy is in force. For PED cover is available only after 4 years. For Non Allopathic treatment cover is available up to 25% of basic S.I. 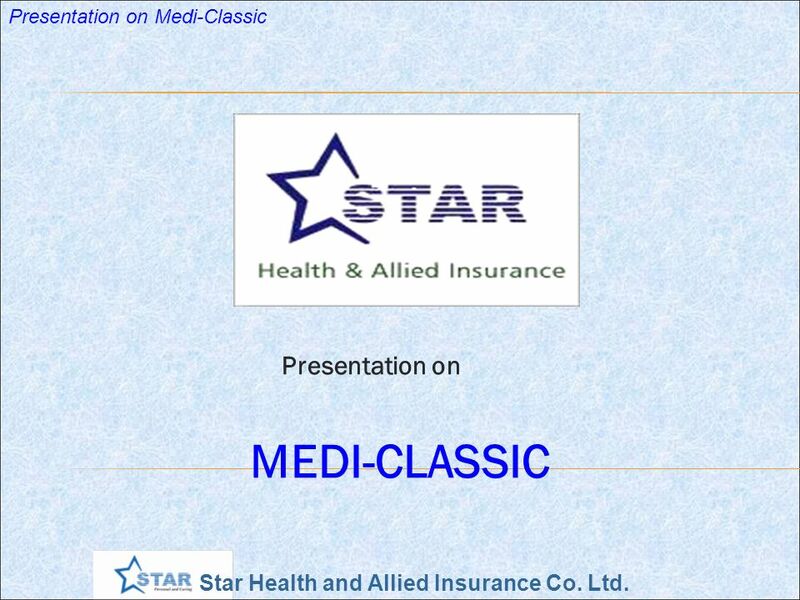 Download ppt "Presentation on MEDI-CLASSIC"
C & C Benefits Group, LLC In Business Since 1977 Specializing In Guaranteed Acceptance Health Plans Licensed Health Agent In 30 States Required by law. USA BENEFITS GROUP GUARANTEED ISSUE HEALTH PLANS USABG EAGLE DIVISION PROVIDING HEALTH INSURANCE SOLUTIONS FOR 36 YEARS. Health Access Plans The Right Plans for Difficult Times. Mediclaim Policy Read on to know more…..
GRADUATE COLLEGE. s are sent to the students official UA address during each fall and spring Open Enrollment Period. Students. 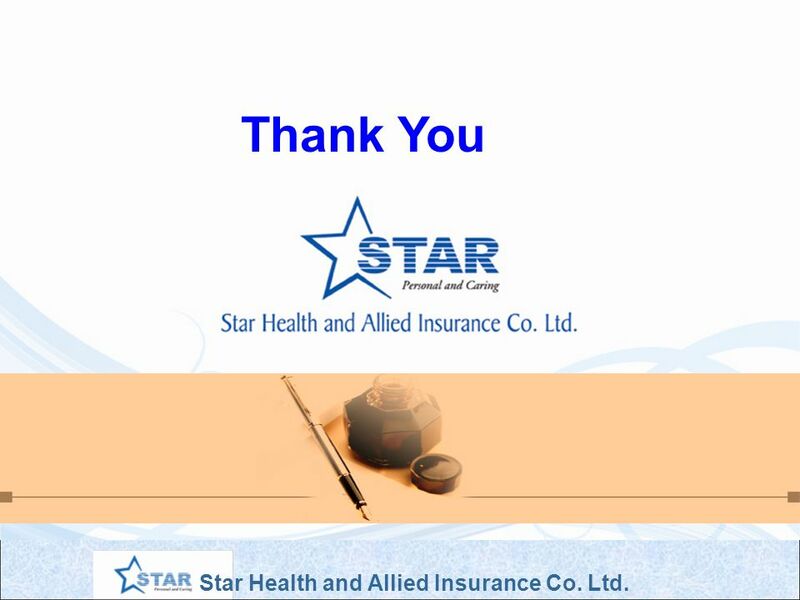 STAR HEALTH AND ALLIED INSURANCE COMPANY LIMITED PERSONAL & CARING STAR HEALTH AND ALLIED INSURANCE COMPANY LIMITED PERSONAL & CARING. 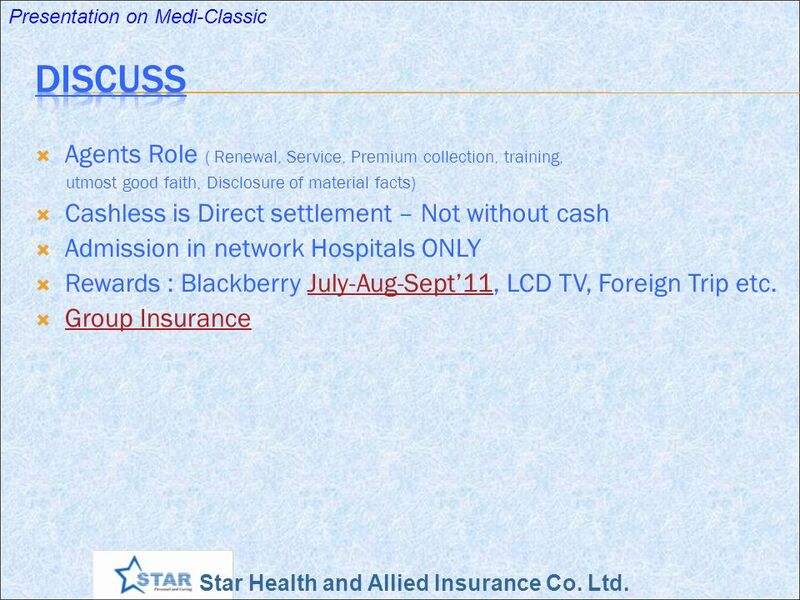 Star Health and Allied Insurance Co. Ltd. Presentation on Star Wedding Gift Presentation on Star Wedding Gift. Introducing: Introducing: Low cost deductible supplement insurance plan that can reimburse your health insurance deductible up to $10,000 each year! Deductible. Target Market Competitive Advantages Covered Benefits Plan Particulars Benefit Period Premium comparison Optional Coverage's Application Administrative. 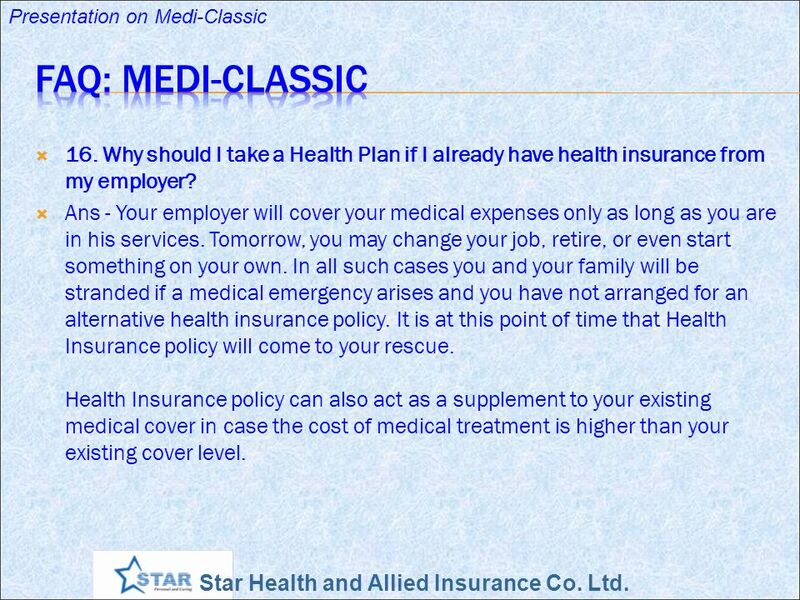 Corporate Employee Benefits: Medical Insurance Programme SmartCare Optimum Provided by AXA SingaporeAdministered by Expat Insurance Pte Ltd. It is a fully loaded Top end Floater Policy for the entire family with High Sum Insured Extended Benefits No Sub Limits No Capping on Room Rent Restoration.